Cognos Developers design develops and deploys multi-dimensional reports using Cognos business intelligence solutions. The highlighting responsibilities of a Cognos Developer are to create data flow diagrams, context such diagrams to represent business processes, create development plans, track report development, create data models, help users in understanding data models, collaborate with modeling and data architecture in designing databases, provide support for all Cognos developer applications, code for Cognos reporting objects, ensure optimal utilization of SQL scripts and documents, analyze data anomalies, troubleshoot all Cognos helpdesk tickets and prepare standard reports. The must-have skills for a Cognos Developer are – strong knowledge of Cognos BI tools, working knowledge in basic report studio, Transformer8, Framework manager, familiarity with the metric studio, scorecard, DMR models and DWH concepts. 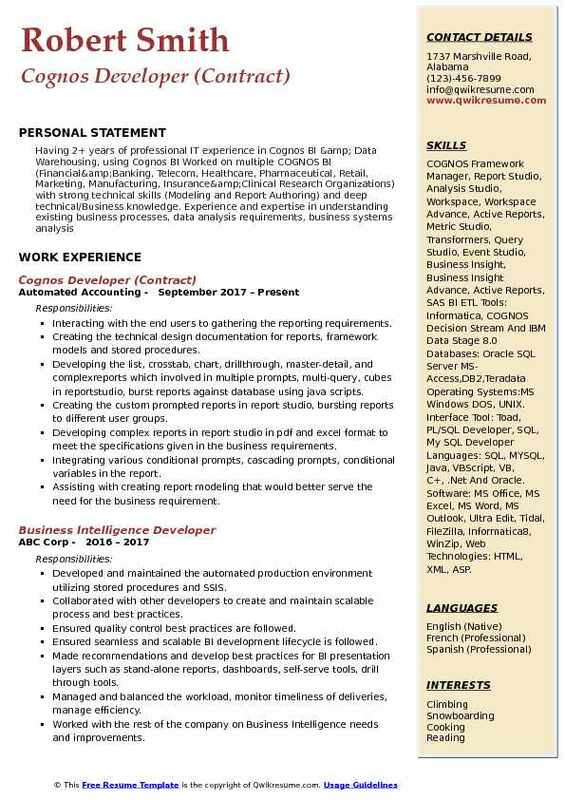 Employers prefer a Cognos Developer Resume that showcases a Bachelor’s or Master’s degree in Computer Science, IT or its related field coupled with work experience in BI technologies. Interacting with the business users to gather business requirements and designing the functional and technical requirement documentation. Implementing the SDK script provided by Cognos support to perform different functionalities. Developing the transformer models using power play transformer (OLAP) and also developing models using Cognos 8.3 / Cognos 8.4 /Cognos 10.1 transformer. Modifying power cubes by adding new dimensions, levels and measures etc. Publishing cubes directly from Cognos 8.3/Cognos. 8.4 / cognos 10.1 transformer using new publish functionality. Proficient in developing business intelligence dashboards comprising several lists, charts, and cross-tabs in a single page as well as multiple pages. Working extensively on relationships between query subjects to better represent the logical structure of the business and the user requirements. Experience in creating drill through and master detail, and multi page reports using report studio. Expertise in creating business models and designing packages using framework manager in cognos 8/8. 2/8. 3/8. 4/cognos10. 1. 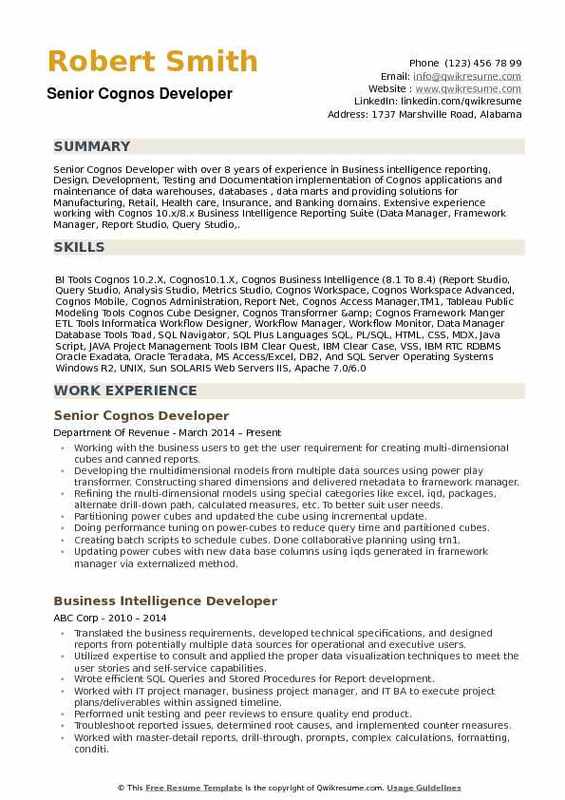 Headline : Sr. Cognos Developer having 6 years of experience in Business Intelligence Reporting. Used Cognos (Framework Manager, Report Studio, Query Studio, Analysis Studio), Cognos 7x, Cognos 8x, Cognos 10.2.x, Cognos 11.x environmentsExpert experience in creating and migrating of Catalogs and reports from impromptu to Cognos [ ] Good Experience in Creating DMR and Relational Model in Framework Manager. Well-versed in developing multi-dimensional cubes and analyzing Power play Transformer. Developed the frame work manager model & reports using big data hadoop files. Created the dynamic cubes using Cognos Cube Designer 10.2 and created reports and dashboards using the MDX functions. Created the cognos dashboards using the Cognos Report Studio with the Oracle data. Have extensively used MDX functions for creating the reports using the cube data. Coordination for integration testing, UAT, UTC and resolved the support issues. Provided the training and documentation to the users on creating the reports using the cube packages and relational packages. Created the cognos reports using the transact SQLs in the report studio and also converted some of them into framework manager package. Created cognos connection with SSAS cubes and published to a cognos environment and developed reports using the report studio. Developed many complex reports as list, cross tab, drill through, master-detail, chart using report studio. Involved in developing framework manager models, coding and testing of the reports in the Cognos 10.2 version. Worked with the business analyst for writing the technical specs and the test cases. Implemented security filters at package level, object level, data level. Gathering report requirements from business users and converted them in to technical documents. Installing and configuring Cognos 10/8.X in Development, QA and Production environments. Designing, developing and implementing an enterprise wide reporting system using cognos 10/8.X. Designing and developing membership ETL job to load extracted information from the stored along with transformation rules, loaded into target systems. Extensively using rave or data visualizations in the canned reports and dashboards. Importing metadata from various sources like dm data mart and dl data mart into framework manager. Creating imported view, business view and dimensional view in framework manager. Creating folders, filters, and complex business calculations in framework manager and report studio. Using framework manager to build models, packages and publish packages to the cognos connection. Creating user groups, roles to implement the cognos security using ldap. Creating complex list, cross tab, and chart reports using report studio. Coordinating in designing and developing of product documents with document writers. Verifyig and reviewing the code, test results and test plans and provided inputs to the team. Authored various types of reports in report studio using dimensional (cube & dmr) and relational data sources. Designed and implemented metadata models in framework manager and powerplay cubes in transformer. Worked closely with different business teams to gather requirements, prepare functional and technical documents and uat process. Designed and implemented new dashboards using portlets pages and cognos workspace. Developed active reports for users to use offline and on mobile devices. Established an audit reporting system for the internal team to monitor, analyze performance and usage of different reports, cubes and other objects. Successfully designed and implemented security on different levels including object and row level security. Developed interactive dashboards using in-report prompts, custom portal pages and inter-portlet communication techniques. Designed and implemented various materialized views to support several views. 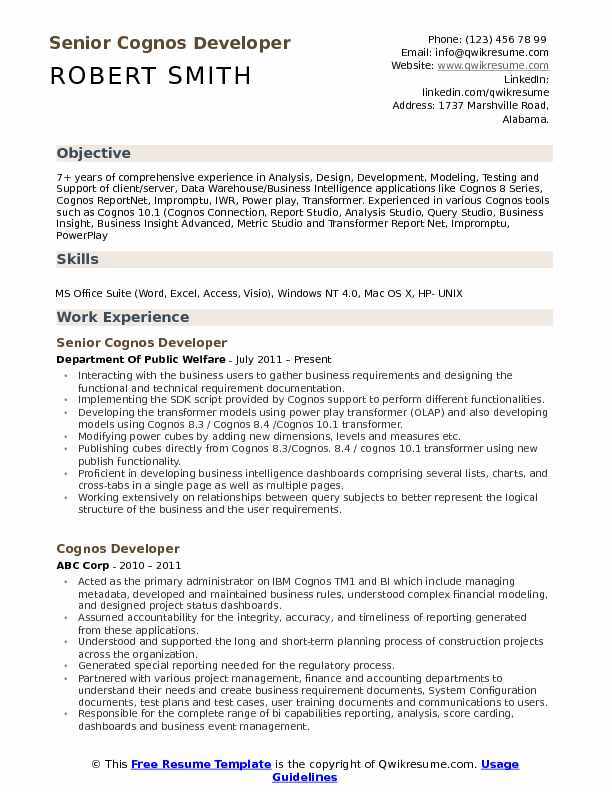 Summary : Over 11+years of professional IT experience in Cognos Report Net, Framework Manager, Query Studio, Report Studio, Analysis studio, Metric Studio and Cognos Connection. Expertise with Framework Manager Modeling (Physical Layer, Business Layer, Packages) and Complex Report building with Report Studio. 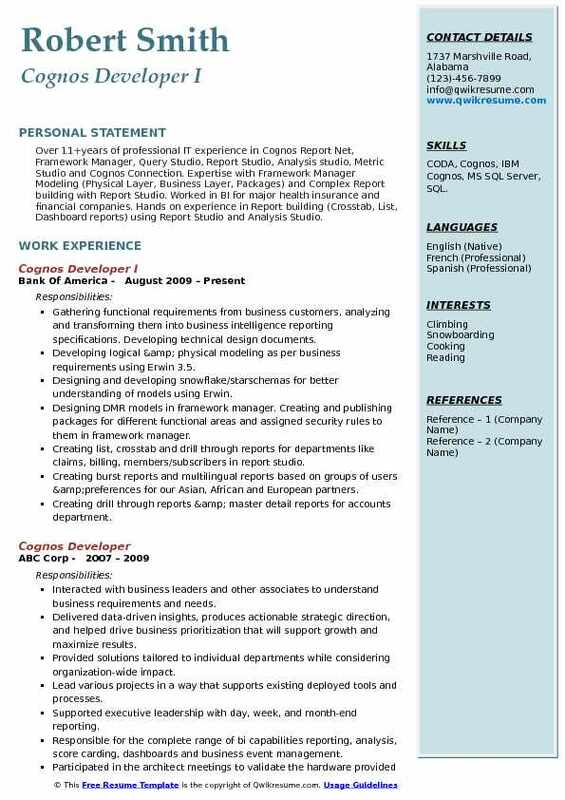 Worked in BI for major health insurance and financial companies. Hands on experience in Report building (Crosstab, List, Dashboard reports) using Report Studio and Analysis Studio. 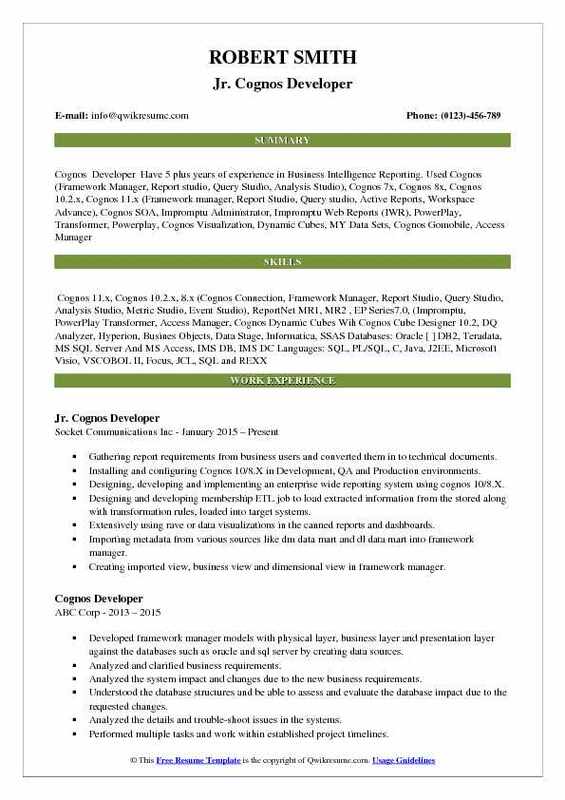 Skills : CODA, Cognos, IBM Cognos, MS SQL Server, SQL. Gathering functional requirements from business customers, analyzing and transforming them into business intelligence reporting specifications. Developing technical design documents. Developing logical & physical modeling as per business requirements using Erwin 3.5. Designing and developing snowflake/starschemas for better understanding of models using Erwin. Designing DMR models in framework manager. Creating and publishing packages for different functional areas and assigned security rules to them in framework manager. Creating list, crosstab and drill through reports for departments like claims, billing, members/subscribers in report studio. Creating burst reports and multilingual reports based on groups of users &preferences for our Asian, African and European partners. Creating drill through reports & master detail reports for accounts department. Creating dashboards, portlets for various hr and payroll related reports. e.g. Investments related to 401k plan were displayed as dashboards showing their investments, returns, losses, dividends earned, etc. Developing reports on risk analysis by comparing the internal data with the experian risk analysis data. This enabled the Sr.Management to take better risk decisions. Creating the complex reports that had multiple pages, with multiple lists, charts, graphs, etc. 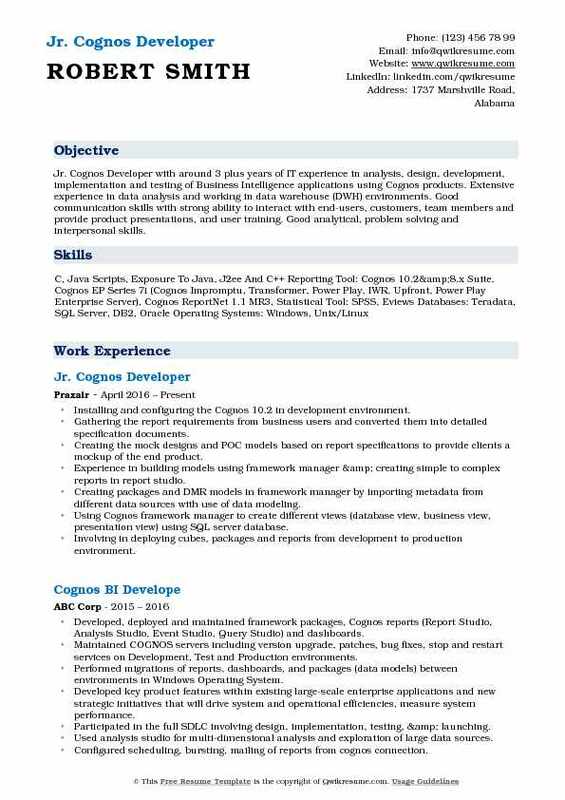 Objective : Jr. Cognos Developer with around 3 plus years of IT experience in analysis, design, development, implementation and testing of Business Intelligence applications using Cognos products. Extensive experience in data analysis and working in data warehouse (DWH) environments. Good communication skills with strong ability to interact with end-users, customers, team members and provide product presentations, and user training. Good analytical, problem solving and interpersonal skills. Installing and configuring the Cognos 10.2 in development environment. Gathering the report requirements from business users and converted them into detailed specification documents. Creating the mock designs and POC models based on report specifications to provide clients a mockup of the end product. Experience in building models using framework manager & creating simple to complex reports in report studio. Creating packages and DMR models in framework manager by importing metadata from different data sources with use of data modeling. Using Cognos framework manager to create different views (database view, business view, presentation view) using SQL server database. Involving in deploying cubes, packages and reports from development to production environment. Designing & implementing the list, cross tab, chart, drill through, master-detail and complex reports with multiple pages/prompts in report studio. Creating the multi-page reports based on multiple master queries to show the data on different pages when the master record changes in a report using report studio. Creating reference queries and increased performance by preventing the execution of individual queries within reports. Performance tuning of the reports implemented by creating summarized tables, views and appropriate indices. Summary : Senior Cognos Developer with 8+ years of total Finance domain experience as Cognos Professional in analysis, design, testing, development and implementation of client/server applications Good experience in Administration, designing, development and deployment of Data Warehousing and Business Intelligence applications using COGNOS Suite 7/ 8/10 and Cognos Report Net Good understanding with Cognos architecture. 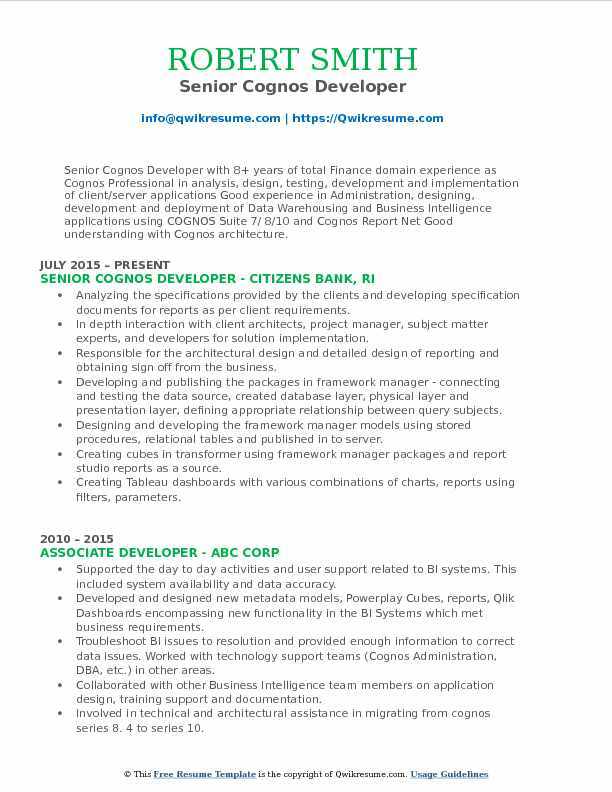 Skills : Reporting Tools Cognos Suite (Framework Manager, Report Studio, Analysis Studio, Cognos Connection, Event Studio, Query Studio) Cognos EP Series 7.3, Business Objects 5.1, Cognos Impromptu 7.3, Power Play 7.3, IWR, Visual Studio. ETL Informatica, Data Manager, Datastage, Erwin Databases Oracle 8i/9i/10g, SQL Server DB2, Teradata, IBM Netezza. Analyzing the specifications provided by the clients and developing specification documents for reports as per client requirements. In depth interaction with client architects, project manager, subject matter experts, and developers for solution implementation. Responsible for the architectural design and detailed design of reporting and obtaining sign off from the business. Developing and publishing the packages in framework manager - connecting and testing the data source, created database layer, physical layer and presentation layer, defining appropriate relationship between query subjects. Designing and developing the framework manager models using stored procedures, relational tables and published in to server. Creating cubes in transformer using framework manager packages and report studio reports as a source. Creating Tableau dashboards with various combinations of charts, reports using filters, parameters. Working extensively on Tableau to produce complex reports to support cognos reporting. Using dimensional modeling (DMR) and snow flake schema modeling technique to develop models. Using informatica 8.X (source analyzer and warehouse designer) to import the source and target database schemas and the mapping designer to map the sources to the targets. Developing various mappings and workflows in informatica as required by the design specifications. Summary : Over 8 years of IT experience and sound knowledge in different phases of software development life cycle (SDLC). 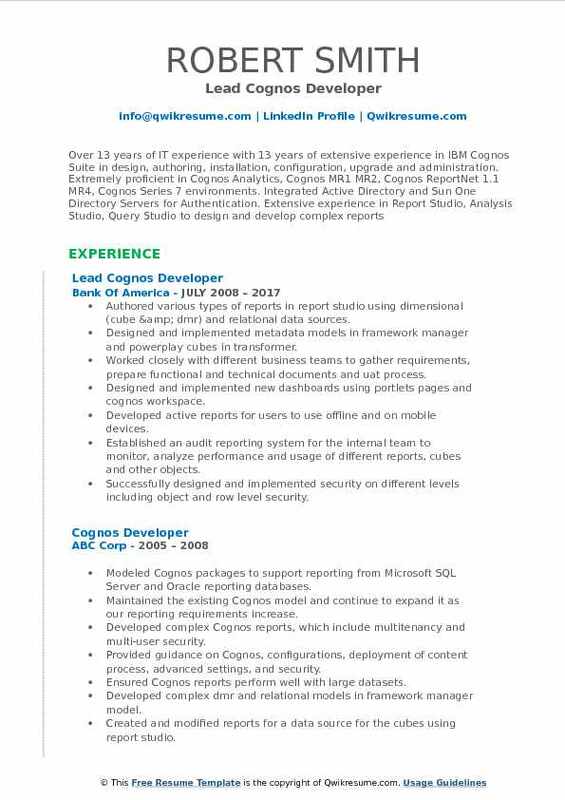 Extensive experience on Cognos BI Suite(Framework Manager, Workspace Advance, Query Studio, Report Studio, and Cognos Connection, Power Play Web). Ability to meet deadlines and handle multiple tasks, decisive with strong leadership qualities and flexible in work schedules. Good analytical and communication skills and ability to work independently with minimal supervision. 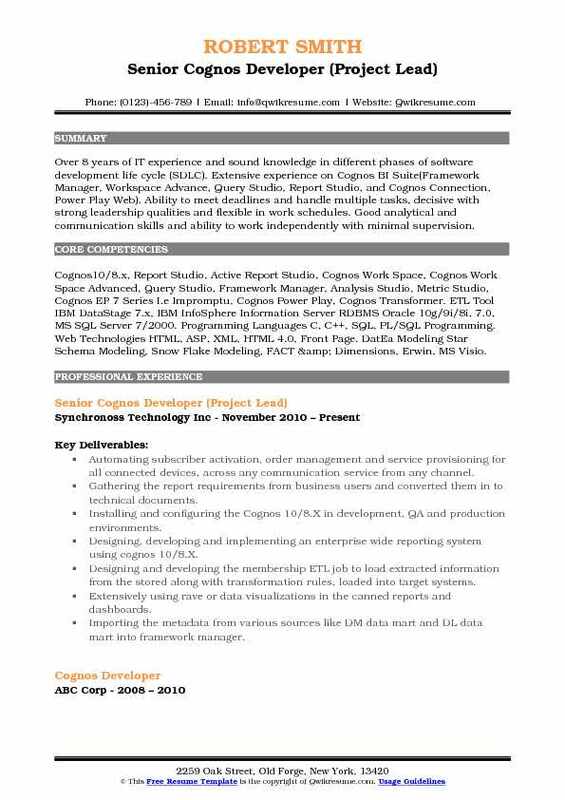 Skills : Cognos10/8.x, Report Studio, Active Report Studio, Cognos Work Space, Cognos Work Space Advanced, Query Studio, Framework Manager, Analysis Studio, Metric Studio, Cognos EP 7 Series I.e Impromptu, Cognos Power Play, Cognos Transformer. ETL Tool IBM DataStage 7.x, IBM InfoSphere Information Server RDBMS Oracle 10g/9i/8i, 7.0, MS SQL Server 7/2000. Programming Languages C, C++, SQL, PL/SQL Programming. Web Technologies HTML, ASP, XML, HTML 4.0, Front Page. DatEa Modeling Star Schema Modeling, Snow Flake Modeling, FACT & Dimensions, Erwin, MS Visio. Automating subscriber activation, order management and service provisioning for all connected devices, across any communication service from any channel. Gathering the report requirements from business users and converted them in to technical documents. Installing and configuring the Cognos 10/8.X in development, QA and production environments. Designing and developing the membership ETL job to load extracted information from the stored along with transformation rules, loaded into target systems. Importing the metadata from various sources like DM data mart and DL data mart into framework manager. Creating complex list, cross tab, and chart reports using report studio. Skills : COGNOS Framework Manager, Report Studio, Analysis Studio, Workspace, Workspace Advance, Active Reports, Metric Studio, Transformers, Query Studio, Event Studio, Business Insight, Business Insight Advance, Active Reports, SAS BI ETL Tools: Informatica, COGNOS Decision Stream And IBM Data Stage 8.0 Databases: Oracle SQL Server MS-Access,DB2,Teradata Operating Systems:MS Windows DOS, UNIX. Interface Tool: Toad, PL/SQL Developer, SQL, My SQL Developer Languages: SQL, MYSQL, Java, VBScript, VB, C+, .Net And Oracle. Software: MS Office, MS Excel, MS Word, MS Outlook, Ultra Edit, Tidal, FileZilla, Informatica8, WinZip, Web Technologies: HTML, XML, ASP. Interacting with the end users to gathering the reporting requirements. Creating the technical design documentation for reports, framework models and stored procedures. Developing the list, crosstab, chart, drillthrough, master-detail, and complexreports which involved in multiple prompts, multi-query, cubes in reportstudio, burst reports against database using java scripts. Creating the custom prompted reports in report studio, bursting reports to different user groups. Developing complex reports in report studio in pdf and excel format to meet the specifications given in the business requirements. Integrating various conditional prompts, cascading prompts, conditional variables in the report. Assisting with creating report modeling that would better serve the need for the business requirement. Extensively creating reports using illustrated charts that provide a better understanding of the subject matter. Imported metadata from multiple data sources to build a model and publishing packages from framework manager to the cognos connection. Secured Cognos connection and setup cognos security by assigning users to the groups and roles defined in cognos namespace. Scheduled management - daily, weekly, monthly, and quarterly and yearly reports. Created packages with various security settings and published them onto cognos connection. 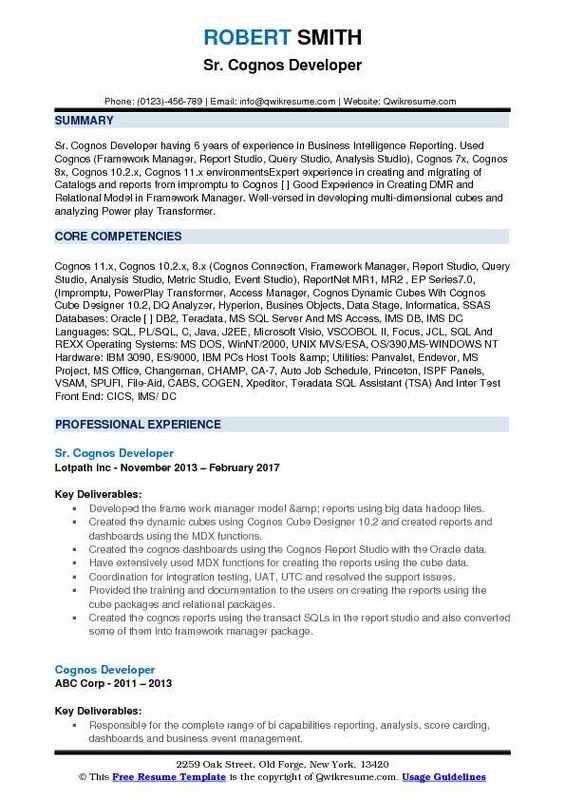 Summary : Senior Cognos Developer with over 8 years of experience in Business intelligence reporting, Design, Development, Testing and Documentation implementation of Cognos applications and maintenance of data warehouses, databases , data marts and providing solutions for Manufacturing, Retail, Health care, Insurance, and Banking domains. Extensive experience working with Cognos 10.x/8.x Business Intelligence Reporting Suite (Data Manager, Framework Manager, Report Studio, Query Studio,. Working with the business users to get the user requirement for creating multi-dimensional cubes and canned reports. Developing the multidimensional models from multiple data sources using power play transformer. Constructing shared dimensions and delivered metadata to framework manager. Refining the multi-dimensional models using special categories like excel, iqd, packages, alternate drill-down path, calculated measures, etc. To better suit user needs. Partitioning power cubes and updated the cube using incremental update. Doing performance tuning on power-cubes to reduce query time and partitioned cubes. Creating batch scripts to schedule cubes. Done collaborative planning using tm1. Updating power cubes with new data base columns using iqds generated in framework manager via externalized method. Using power play for further analysis, slice and dice, drill down and creating reports from cubes. Involving in design phase, gathered requirements from users and documented/designed/developed report specifications including report documentation for creating reports using report studio. Creating profitability reports using tm1. Developing complex reports using report studio which includes various report types ranging from simple lists, crosstabs and chart through complex dashboards, drill-through, master-detail and conditional formatting.